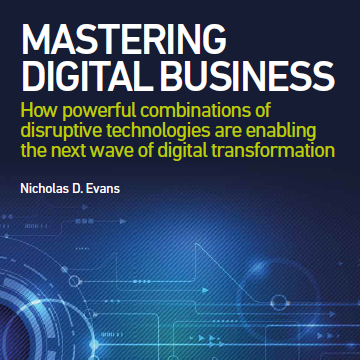 Big Ideas from Nicholas Evans in Innovation, Digital Transformation & Disruptive Technologies. 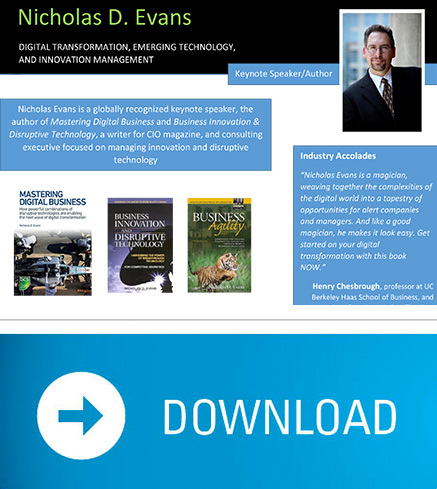 Thought leadership in the fields of innovation management, digital transformation and disruptive technologies. The four strategic themes for leading digital disruption – disruptive technologies, platform business models, digital services mastery and leading practices in corporate innovation. Five critical pillars that need to be a part of any large-scale initiative – innovation management & measurement, innovation infrastructure, and internal, customer and open innovation communities. Innovation methodologies should support both event-based (e.g. innovation events, contests and workshops) and ongoing ideation vehicles (e.g. corporate-wide innovation databases all the way to more focused corporate strategic communities). More than mobile-enabling existing processes, this is an opportunity to completely re-think and re-design mobile processes from the ground up via the “wow factor”, the “must have”, the “innovative replacement”, and the “mobile upgrade”. Ten attributes of a world-class digital customer experience that form the basis for a Digital Customer Experience (DCX) Bill of Rights. By instrumenting the human and socializing the machine, we can redesign business processes to optimize the blend of human-machine participation and interaction — and complete tasks far more efficiently than either could individually. It’s no longer sufficient to have an innovative set of products or services, you have to be a master of how you design, develop, deploy, manage and continually evolve your digital services as well. Five areas where today's innovation management software needs to evolve to support the ever-expanding needs of the business with regard to digital transformation.